Tech. Sgt. Anthony Farnsworth, 388th Operations Support Squadron Aircrew Flight Equipment shop, works on flight equipment, Nellis Air Force Base, Nev., Feb. 5, 2019. AFE Airmen manage, check and prepare gear pilots need to fly and also survive in the event of an emergency. The F-35 is lethal and survivable in almost any environment, but it’s just a machine, unable to do anything without a skilled pilot. 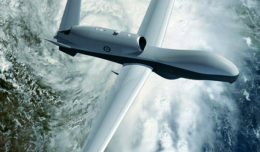 Those pilots need gear to interface with the jet, operate and survive. 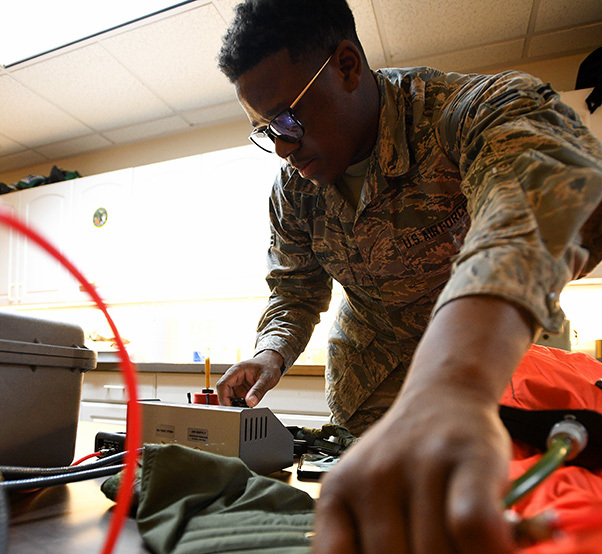 Outfitting the pilots is the job of the Airmen in the 388th Operations Support Squadron Aircrew Flight Equipment shop. 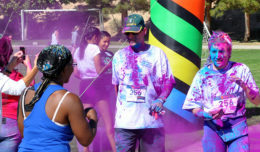 A handful are currently deployed from Hill Air Force Base, Utah, to Nellis AFB, Nev., for Red Flag 19-1. Red Flag is the Air Force’s premier combat training exercise where units from across the Air Force join with allied nations in a “blue force” to combat a “red force” in a variety of challenging scenarios over three weeks. 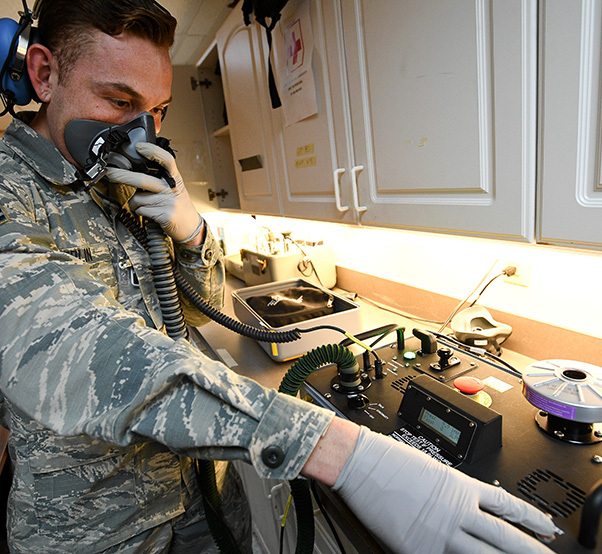 Airman 1st Class Ryan Joplin, 388th Operations Support Squadron Aircrew Flight Equipment shop, checks a mask, Nellis Air Force Base, Nev., Feb. 5, 2019. AFE Airmen manage, check and prepare gear pilots need to fly and also survive in the event of an emergency. Farnsworth and his team show up hours before the mission begins and work on checking and preparing “anything and everything” pilots need to fly the jet or survive in case of an emergency — jackets, harnesses, G-suits, oxygen masks, helmets, survival kits, parachutes. As Joplin inspects helmets, Airman 1st Class Henri Steel uses a compressor to pump air into a G-suit to ensure it can withstand the pressure. All of the Airmen say that while the job is rewarding and they know they have a direct impact on the mission, the thing they enjoy most is their relationship with the pilots. 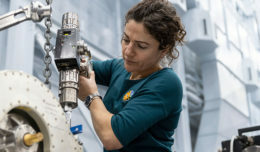 Airman 1st Class Henri Steel, 388th Operations Support Squadron Aircrew Flight Equipment shop, works on flight equipment, Nellis Air Force Base, Nev., Feb. 5, 2019. 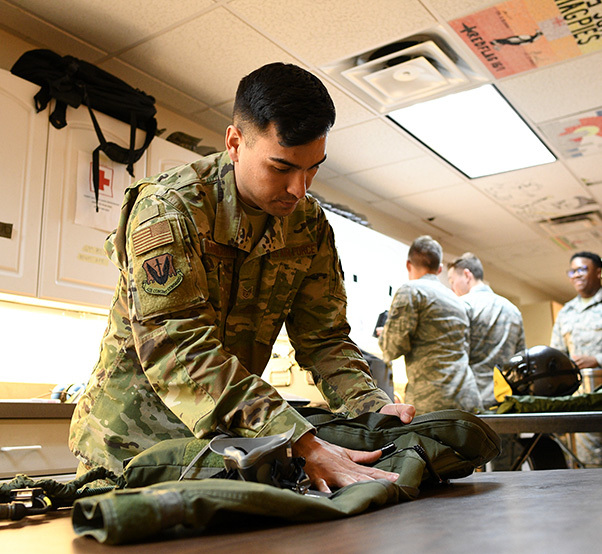 AFE Airmen manage, check and prepare gear pilots need to fly and also survive in the event of an emergency. Staff Sgt. Brandon Cunningham, 388th Operations Support Squadron Aircrew Flight Equipment shop, works on flight equipment, Nellis Air Force Base, Nev., Feb. 5, 2019. 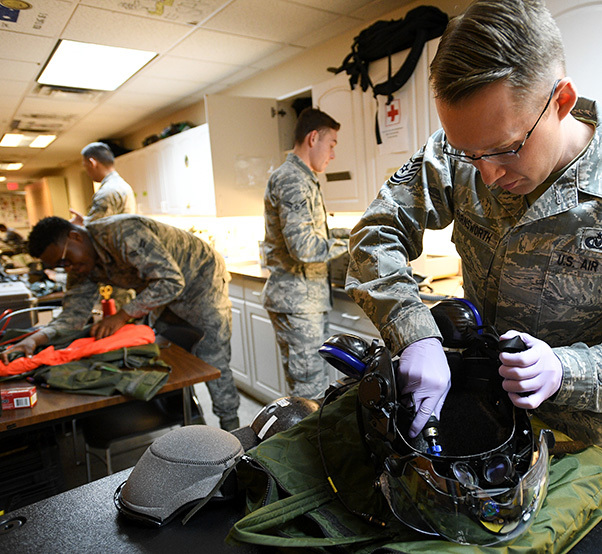 AFE Airmen manage, check and prepare gear pilots need to fly and also survive in the event of an emergency.